When will be The Adventures of Jim Bowie next episode air date? Is The Adventures of Jim Bowie renewed or cancelled? Where to countdown The Adventures of Jim Bowie air dates? 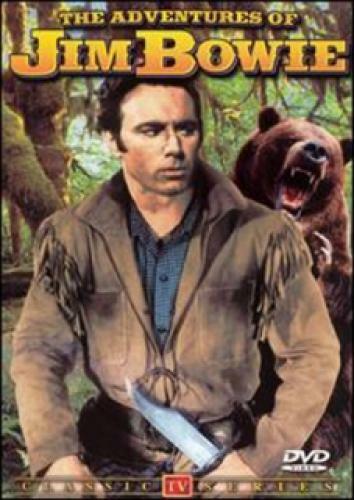 Is The Adventures of Jim Bowie worth watching? Based on The Tempered Blade by Monte Barrett, this series debuted in 1956 and featured Scott Forbes as real life early 19th century American adventurer, plantation owner, and hero of the Alamo, Jim Bowie. Bowie is remembered for designing a knife that still bears his name. He was a bold adventurin' man! Battled for right with a powerful hand! He was a fighter, a fearless and mighty adventurin' man! A hand gripped the knife's hilt and yanked the blade from the wood. Scott Forbes then stepped into view clad in fringed buckskins. Brandishing the knife in a confident and no nonsense manner, Scott (as Bowie) glared boldly as well as seductively to the left, the right, and finally into the viewer's eyes as he opened the door and stepped inside. The show's Main Title and theme song are remembered today by legions of babyboomer fifties TV fans. The show dramatized Jim's adventures with a variety of genteel plantation folk and not-so-nice frontier characters in Louisiana's bayou country. The show appealed to both adults and children and generated merchandise that included toys and comic books. EpisoDate.com is your TV show guide to Countdown The Adventures of Jim Bowie Episode Air Dates and to stay in touch with The Adventures of Jim Bowie next episode Air Date and your others favorite TV Shows. Add the shows you like to a "Watchlist" and let the site take it from there.